Hedonism (43.0%): So, I am back to the house of Compass Box, but this time digging in the archives a little. I have an old bottling of Hedonism on my desk. I am not quite sure how old this particular release is but if I want to guess I would say from 2003 or 2004 maybe... I am pretty sure as soon as Robin Robinson reads this post he will give us the most correct info about the release date.. 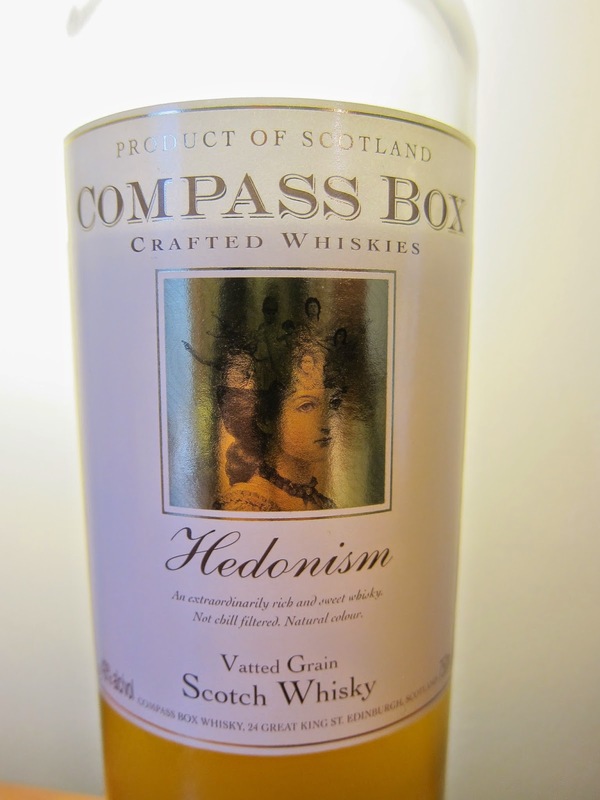 Anyway, Hedonism is a blended grain whisky from Compass Box's Signature Range. Created by John Glaser in 2000 it's recipe kept changing from batch to batch due to the availability of certain casks but usually kept a similar taste profile including grain whiskies sourced from Cambus, Cameronbridge, Carsebridge, Port Dundas and/or Dumbarton distilleries. Color: Oaked Chardonnay, lemon chiffon. Nose: Spearmint, vanilla and toasted coconut flakes. Aged Caribbean rum, whipped maple cream, melted and slightly burnt butter. Banana cream pie... Feels like walking in a small pastry shop in Paris on an early morning in Winter. Windows are steamed, all the tables are full and there is a long line in front of the register. Adding a few drops of water makes it even more buttery. I might have drooled on my keyboard when I am nosing this thing. Gosh... Palate: Oh yes, we are very much in that pastry shop..! I knew it... Toasted oak, rum - raisin ice cream and velvety lightly roasted coffee. Burnt creme caramel, flaky pastry with cream filling who knows what berries on top and lemon meringue pie. Finish: Medium long but warming with coconut, vanilla bean scrapings and Malteser balls. Overall: Every single batch of Hedonism I taste gives a foolish smile on my face... Cannot help it. So silky, doughy, warming and sweet... An amazing proof what a very well chosen ex-bourbon cask can do to grain whiskies. It is a must have for any whisky lover's cabinet. Thanks to Joe Howell pulling this bottle from the depths of Federal Wine and Spirits' cellars for us.